Lovely hotel with friendly staff Warm welcome from the reception team. Check in was super easy, my room was clean, comfy, well appointed and welcoming. Breakfast was amazing with a huge choice of fresh produce. I would highly recommend the Scandic Park. Dirty toilet Toilet in our room was dirty, as well as the blanket-sheet. Everything else was ok.
One day trip to Ateneum. All was good, but in our room were only one chair to sit. Mustique room type is very very small. It's not comfortable place to overnight at all! Ebookers is selling room without breakfast and Hotel webshop with br. So Ebookers price is much higher. I was disappointed. 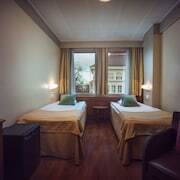 Comfortable hotel; good breakfast; nice room; helpful and friendly staff; would certainly stay their again. 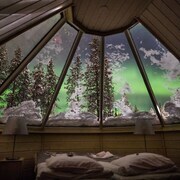 There are so many places to stay in Finland that it can be tricky to whittle things down. This is where ebookers comes in: we can show you the best hotels in Finland in a matter of moments. You’ll be able to see all the hotels on a detailed map, so you can check how close they are to various landmarks. In fact, you can specifically search for hotels that are close to specific attractions, as well as filtering your search for lavish, high-end hotels or comfortable, cost-effective accommodation. 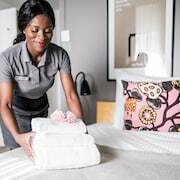 Our informative hotel descriptions, which include photos of the various pads and details on rooms and amenities, will help you make the right decision for your getaway. Whether you’re coming from near or far, you can make use of ebookers to organise your journey to your hotel in Finland. Searching for flights to Finland will instantly show which airlines and routes are available for your chosen travel schedule. You can then look up our car hire deals and arrange to have a vehicle waiting for you when you arrive, so you can go seamlessly from the airport to your hotel. Having your own wheels will also make it easy to travel around and visit more remote towns and villages, as well as rustic restaurants that might be out in the rural areas. You have a whole, exciting country to explore, after all. Let’s face it, one of the joys of being on holiday is doing as little as possible. Even just lounging around your hotel is an activity in itself. Of course, there’s so much to see in Finland, and if you’d like some inspiration then check out our Things to Do tool. This will lay out the attractions and major sights around your Finland hotel, so whether you’re just looking to wander and sightsee, or explore cultural attractions and places to take the whole family, ebookers will have you covered.